I was very pleased today when a rather large box arrived. I had been warned that it was big, but sometimes nothing can quite prepare you for the size of what actually turned up. I had been a bit more restrained in my additional purchases that some (I’m looking at you, Mr Hobbs) and I wish I’d been able to get a couple more boxes (I honestly thought that I’d ordered the Demon KS exclusive). In the end, I had the King Pledge, plus 3 additional boxes. I didn’t have time to open the boxes until this evening, but I did manage to look at the recent comments on the Kickstarter page. It’s fair to say that feedback so far is…mixed, to say the least! So, despite having seen some of the figures at the weekend, I approached the actual opening of the box with some trepidation. Now, fellow podcast host Mike Hobbs has written a comprehensive set of unboxing articles on his blog, which are well worth a read. I’m just going to add some of my thoughts. As with many things, you would probably start by opening the small boxes first – these are the easiest. The trouble is, in doing so, this is a bit like opening a can of worms. The Sabre-Toothed Tiger is not so good. It doesn’t compare well to the render shown on the KS, with the body having very little detail or texture. The third box contained Vanir Valkyrie, and there is no getting away from the fact that this is a very poor model indeed. Poorly defined facial features, little to detail or texture in her hair or cape, and indeed a part of the model at the back of the head that has seemed to lose all detail completely. Yet this model cost $12, which is certainly the sort of price you would expect to pay for a high quality metal miniature. Thankfully, the two main pledge boxes are much better. These are rammed full of miniatures and card stock, and weigh an awful lot between them. The rule books look good. Much has been made across the web that actually trying the learn to play the game with them is somewhat problematic, and indeed Monolith have promised a revised version, but they look nice enough. Artwork. Quite simply excellent, right across everything in the game. Boards and Cardstock. Again, excellent quality. Custom Dice. Sorry, but these are truly awful. Printed rather than etched, and poorly printed at that, I can see problems occurring with these after a few plays due to symbols being worn off. So, most of the game components (with the exception of those god-awful dice) are very good. But, one of the huge selling points of Conan was the metric shed load of miniatures that came with the game – what are these like? In truth, the answer is that they are a bit mixed, with the fault simply to do with the plastic the figures are cast in. The ‘Hero’ figures are cast in a light grey plastic, whilst the ‘Villians’ are in a darker grey plastic. There is no doubt that the lighter coloured material both appears to be softer, and does not seem to cast detail as well, which is frustrating, as the majority of the miniatures in the game are actually pretty good – it would be interesting to see what the light grey models would look like is cast in the darker material. There have been some complaints about a certain inconsistency of figure scale in the sculpts, which is true, but at the same time strikes me as itself being consistent with the original artwork of Conan. Conan is a hulking brute (making even Arnie look like he needed to bulk up in order to play the role) whilst the majority of females are slender and athletic – this is reflected in the final figures. It might look a little strange, but at least it’s consistent with the mythos. I think some of the frustration comes out when comparing these three miniatures above. How can a company that produces something as good as the giant snake (probably one of the best miniatures in the game) or the Thog (not as good as the snake, but really nice – if all the miniatures in the Deep Madness Kickstarter are this good, I will be more than happy!) then produce something as poor as the lion? They don’t look like they belong in the same game, or indeed have been produced by the same company. Or how about this Thaug? What an awesome figure that is! Given the overall good quality of the majority of game components and miniatures, I feel that spending $135 for my King Pledge was very good value for money – and that’s even before I have played a game! I am very disappointed with the overall standard of the add-on boxes, but I am willing to be more philosophical about those at this moment in time, given that I didn’t spend that much extra money on them, and put it down to experience – although I would be interested to hear Monolith’s response to feedback. 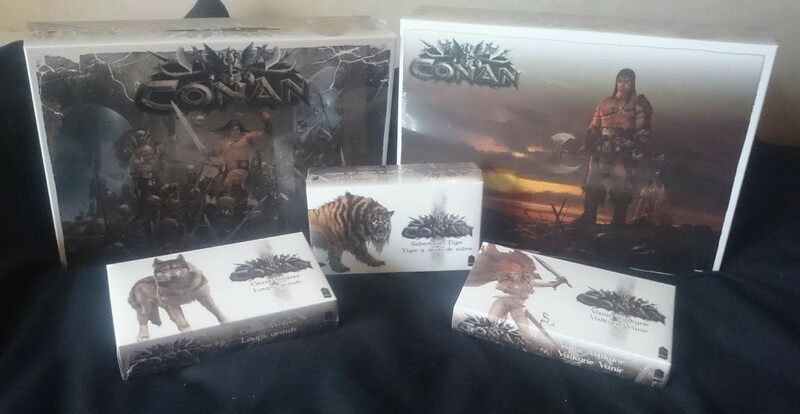 Bearing in mind the extra scenario book coming next year, not to mention the additional material from the Conan RPG, as long as the gameplay is half as good as what I have seen so far from a few online walk-throughs and battle reports, I think this has been a sound investment. It has been a long wait, but I’m pretty pleased with the result. This was the first KS where I went heavily on add-ons, and I rather regret it. The base pledge is fantastic value, most of the minis very good (exceptng the lion), but the sabre-tooth tiger and dragon I really…how did they let that through? I went for the Barbarian pledge with no add-ons, which seemed by far the best value. Why pay $12 for an extra figure when you are already getting more than 150 figures (including lots of heroes) for $90 ? I agree about the quality of some of the figures, but I’d not noticed anything about the dice. We played for the first time last night and had two good games. Excellent review. It seems the white ones have the same problem some of the Reaper Bones have. I wonder why they did not produce them all in the grey material / mix.